Unfortunately, I missed seeing Bret Michaels this past Memorial Day weekend. It’s also looking like I will be missing Poison and Motley Crue when they come down the weekend after the 4th of July. Between time restraints, no money, and the fact that my husband would probably get arrested for punching some random dude that looked at me wrong, the Fates have decided that I shall miss out on all the great shows this year. I suppose it’s not a complete loss. While I had hoped to shove Bret’s own personal autographed copy of my latest novel The Red Fang right up under his nose since it is, after all, dedicated to him, I guess I will have to settle for mailing him his copy instead. I’m just thankful that I finally finished writing the novel. Thinking of Bret and his awesome gigs brings me back to last year’s show. 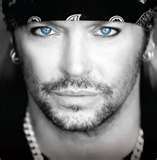 The Hardrock was Bret’s first concert after his harrowing health scares. The place was sold out, fans were going crazy (myself included), women were crying and clawing at the stage, the room was electric with emotions and spirits were running high. It was epic. As the show progressed, I looked around to see women my age with their 8-year-old daughters beside them, both mom and daughter screaming and dancing and enjoying the pure energy that pulsed throughout the stadium. I glanced over to my right to see a woman who had to be in her 60s with her fist thrust in the air, keeping beat with the music while she kept a death grip on the railing in front of the stage so she didn’t lose her place. It was then that I had a sudden vision of my future. I could see myself and Bret, 30 years from now. Bret would be up on that stage in a wheelchair if need be, the air more electric than ever with emotions from thousands upon thousands of his loyal fans. I saw myself there, my walker raised in the air screaming, “You rock, Bret!” as he thanked his audience for allowing him to continue to perform and God for granting him the strength and health to do what he loved. It’s been 25 wild, wonderful years of ups and downs with some of the best music ever heard by mankind. I hope that Poison and Bret see 25 more years of electrifying shows and screaming fans. I hope that I’m right there with them, screaming and dancing along with all the other rabid Poison and Bret Michaels fans, eager to announce to the heavens that I am a Bret Michaels fan. And Bret? You still rock!